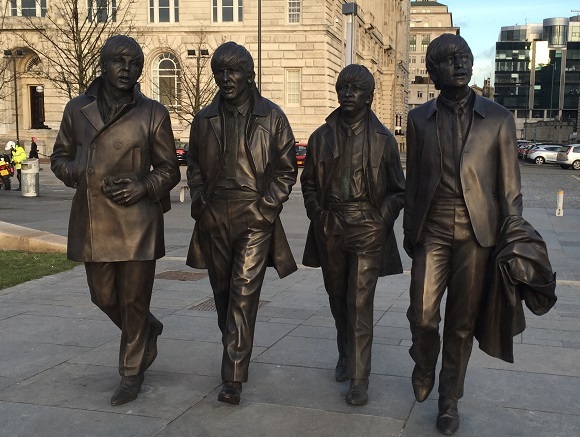 A new bronze statue of The Beatles has been unveiled on Liverpool’s waterfront by John Lennon’s sister, Julia Baird. The sculpture, gifted to the city by the Cavern Club, depicts the Fab Four walking along in front of the Cunard Building. The idea for the statue came from Chris Butler, Managing Director of Castle Fine Art Foundry Ltd, who was inspired when walking through Liverpool One and saw the huge image of the band outside HMV. He said: “This is a statue that needs no title, no explanation, no instruments, no gimmicks. It’s a monument to a moment and the moment started in Liverpool. The team at the Cavern responsible for the gift wanted it to acknowledge how instrumental the band is to the city’s fortunes and their hope is to draw fans from around the world to Liverpool to witness the new artwork down at the Pier Head. Sculptor, Andy Edwards, thoroughly researched the piece in order to exactly capture the images of Paul, Ring0, George and John before casting them in clay and resin. Mr Edwards said: “I can remember walking around the waterfront with the original sketch models and everybody wanted to talk to us – everybody has a Beatles story. Our image of them seems to bring past present and future together, like a time machine. The 1.2 tonne statue was unveiled at the weekend by Julia Baird and Deputy Mayor of Liverpool, Councillor Ann O’Byrne, and marks 50 years since The Beatles final public appearance in Liverpool, at the Empire on December 5th 1965.